Introducing Carlos, a glass vase that takes on the figurative art movement of the moment with plenty of playful character. Made from recycled glass and measuring width 13cm x height 23cm, Carlos is a seriously stand-up guy, promising an eccentric style statement to suit even the most eco conscious of homes. Please note, as the Carlos Glass Vase is hand blown using 100% recycled glass, each vase has a unique look and comes with the expected variations of a handmade product - though we think this only adds to charm of this fabulous glass vase! If you’re a fan of the abstract face illustrations that have taken the interiors world by storm, then you’ll love the glass face vase of Carlos! Inspired by art from the 50s and 60s, the Carlos Vase features rich textures across the detailed glass surface to capture this fella’s lush locks and sweeping moustache. 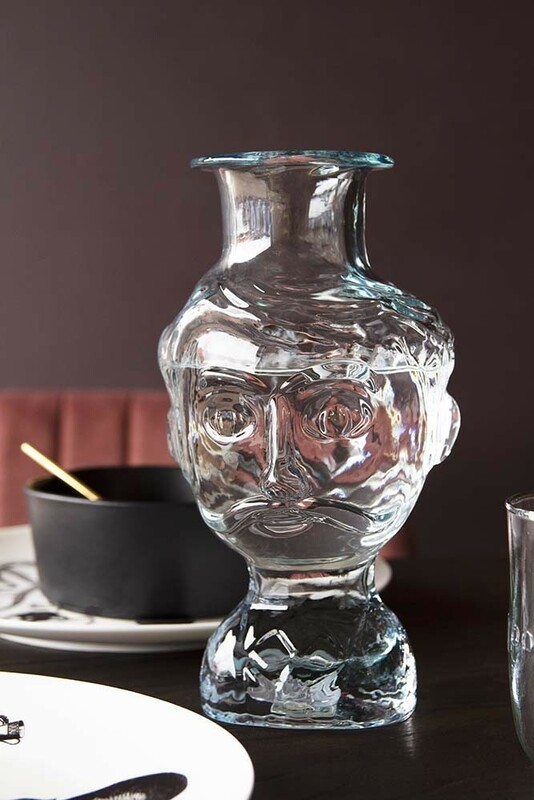 Introducing a dash of humour to life in the kitchen, the decorative glass face vase is a strong statement piece that adds kitsch character to any interior, from the kitchen to the dining room and cool, contemporary living spaces. A statement in itself, the Carlos recycled glass vase is easy to style in any spot of your home. We love to display the Carlos Glass Face Vase in the centre of the table filled with water for a more playful approach to everyday dining, or to create the final finishing touch to your décor scheme, fill the Carlos vase with fresh flowers for a botanical feature that celebrates eccentric style.